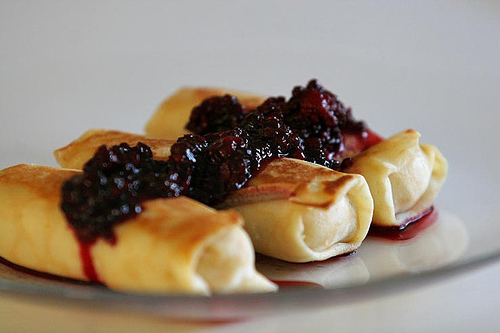 Blintzes are essentially Eastern European crêpes, and have come to be associated in particular with European Jewish cooking. They can be filled with many different things including mashed potatoes or berry sauce, but sweetened cottage cheese is perhaps the most traditional (and in my opinion most delicious) filling. Ben's Grandma's recipe calls for pineapple jam as well, which sounds kind of weird. I assume you could omit that if you're a purist like me.